Hi, I'm late by a day again. Gosh... Hope it won't set a new "trend". lol.. hmm... though I'm late in blogging about Day 9, I had done this watercolor yesterday. My Note4 handphone had an accident yesterday morning. My kids playing beside me while I was busy messaging suddenly hit my phone with their hands. It flew into the air, dropped and hit a metal chair at a coffee shop. And the glass screen cracked!!! And gosh... was I so heartpain. So I sent to Samsung service centre to change the screen at an exorbitant price!!!!! 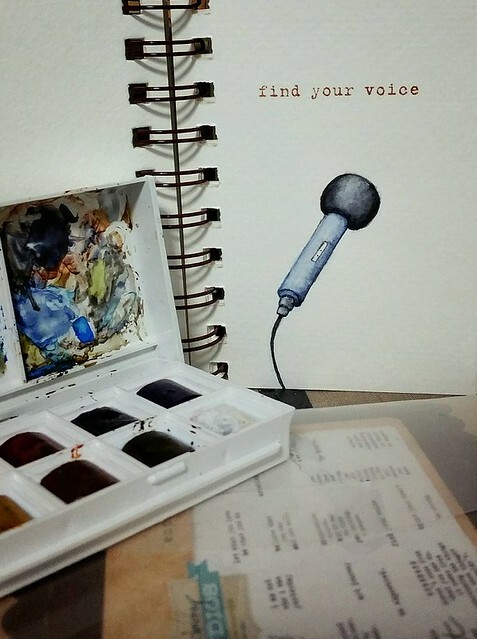 Today's theme is Find your Voice. I'm using the Unity/Donna Downey sentiment stamp set, "Empowered Words". I thought of a microphone when I saw this sentiment. As a timid girl, I was always afraid of speaking up and had difficulty rejecting people. And this trait had landed me in sticky situations many times. Especially when comes to rejecting sales person. I have to quickly cut off their speech before they finished. Else I would end up saying "yes" though my heart is "no". To many it sounded so rude. But that's my natural response before my "soft-heartedness" lands me in trouble. So today I want to remind myself to say NO and to learn to speak up. And one funny thing that God had done for me. I was such a shy, scaredy cat girl (especially in the past) and yet He placed me in the church choir. I was following my friend to join a ministry and boy... I had no idea whats that ministry till I'm inside. LOL.. yes.... that's how naive I used to be. And my fear of speaking up or rejecting people caused me to stay on the choir ministry for years. I learned how to project my tiny voice out and to be more confident. And I realised I loved singing for God. And I'm currently still in choir. Thank God for placing me in the right ministry that I can serve him out of my weakness. And through it, He strengthened me. So for those who are shy and timid and fearful, fear not. Learn to speak up and speak from your heart.